Each child diagnosed with an autistic disorder differs from every other. 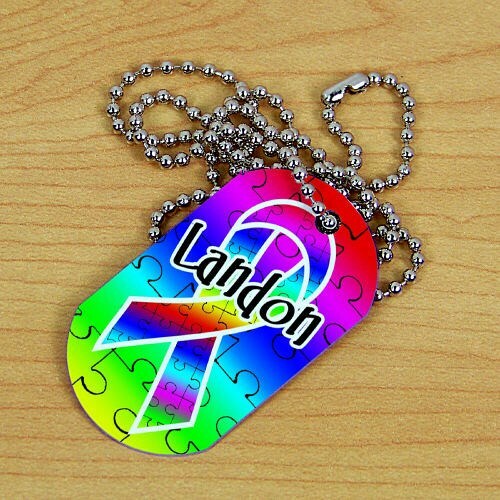 Help spread the awareness of autism by proudly wearing this colorful Personalized Autism Awareness Ribbon Dog Tag. The brightness of the colors shows hope so people with autism can live a full and happy life. Showing your support with Autism Awareness Products like this Autism Dog Tag is just one step closer to helping families that need us the most. LOVED THIS DOG TAG FOR MY SON HE HAS AUTISM AND CANNOT TALK SO THIS IS PERFECT. I WILL BE ORDERING MORE PRODUCTS FAST SHIPPING THIS COMPANY IS AWESOME FOR WHATEVER YOUR CAUSE IS I WILL ALSO BE ORDERING LUPUS MERCHANDISE AS THESE ARE IMPORTANT TO MY FAMILY SO WHAT ARE YOU WAITING FOR PLACE YOUR ORDER TODAY! !!!! My friend who is Autistic can have meltdowns in public areas if overstimulated by her environment. Having this dog tag on with another with her emergency contact info is very helpful to first responders. It is bright and very colorful. She loves it and wears it with pride. I get comfort in knowing she can be identified and treated correctly if she becomes non verbal. I should have just had "DUSTIN" put on it instead of DUSTIN with OUR LAST NAME... it is hard to read cause it is all squished together. My son was well pleased with all the different colors in it and wears it all the time. I love these things. Awesome. I wear it everywhere with pride. Additional Info Wear this Autism Dog Tag to help educate everyone about the diversity of the people and families living with this condition. Each Dog Tag shows your continued support in funding the research and treatment and makes the best Autism Awareness Walk Accessory. Autism Ribbon Dog Tags also look great with our Personalized Autism Awareness Athletic Dept. T-Shirt and our Personalized Autism Support Baseball Hat. For every purchase made, MyWalkGear.com will donate a portion of its proceeds to help people and families living with this condition.